"It makes great cocktail napkins, bookmarks, facial tissues. But you know what's best to do with it!" 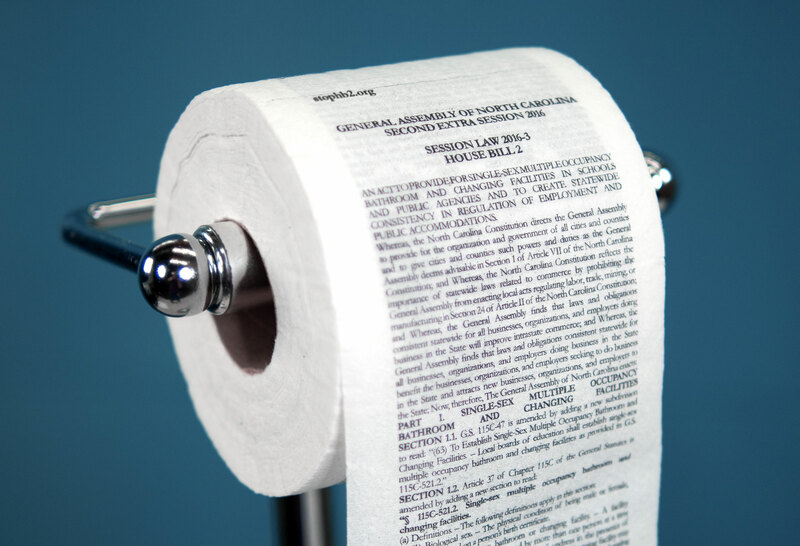 Yes, Durham, N.C., agency McKinney knows where its home state's controversial House Bill 2 belongs—in the toilet. The Charlotte City Council passed a nondiscrimination ordinance in February that included a rule allowing transgender people to use public restrooms assigned to the gender with which they identify. Furious opposition groups supported by Gov. Pat McCrory then ran ads arguing that the ordinance would make it easier for male sexual predators to get closer to victims by posing as women. The state legislature later called a special session to pass "HB2," which requires all North Carolina residents to use the public restrooms associated with their birth gender. The move has enraged civil liberties groups nationwide, and North Carolina has been the focus of plenty of backlash over HB2. McKinney proposes a solution to the HB2 problem: Flush it. And they mean this quite literally, as you'll see in the video below. As noted in the clip, PayPal cited the bill in announcing that it would abandon plans to open a facility in Charlotte. And the NBA also raised doubts about hosting its 2017 All-Star Game in the city's Time Warner Cable Arena, home of the Hornets. Last month, McKinney chairman and CEO Brad Brinegar became one of more than 100 chief executives across the country to sign an open letter asking McCrory to repeal the new law. That group most prominently included Mark Zuckerberg, Tim Cook and Brian Chesky of Airbnb. The letter called HB2 "bad for North Carolina, bad for America, and bad for business." Brinegar also recently appeared on CNN to speak out against a bill he called "regressive" and "reactionary." In a statement, McKinney told AdFreak that it worked on this project "because we value equality, diversity, inclusion and human rights … and we don't care which [bathroom] you feel most comfortable using." "We tried to create something that could stand as a visual for what many North Carolinians think about the bill," added group creative director Will Chambliss. "We hope people read it and then, well, you know the rest." Gov. McCrory has so far resisted calls to revisit HB2, but the bill continues to serve as a considerable headache for the former Charlotte mayor and city councilman. Public opinion polls now show his oppontent, Democratic attorney general Roy Cooper, with a small lead six months before November's gubernatorial election. McKinney mailed AdFreak a roll of the toilet paper so we might join in the efforts to "flush this bill down the toilet of history." We'll let you know how that goes.